This page aims to help you remove “I hacked your device” Email Virus Scam. Our removal instructions work for every version of Windows. The chances of having your computer infected with a Trojan-based virus like “I hacked your device” are very high if you are not careful enough with what you do on the Internet. The reason is, this malware can be encountered all over the Internet and mostly spreads via well-disguised transmitters, which are very difficult to distinguish from normal and harmless web content. One single click on a legitimate-looking link, an ad, a pop-up, or an email attachment may land you the virus if the piece of content you’d interacted with was actually contaminated and, sadly, there will be no symptoms which can indicate the contamination. From that moment on, the nasty Trojan can secretly launch various harmful activities in the background of your system and cause issues and serious damage to all of your data, software, and OS. 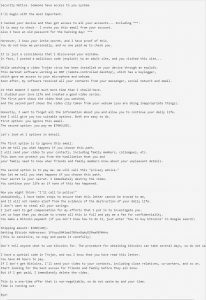 That’s why, if you are one of the victims of “I hacked your device” Email, the information in the next lines may be just what you need to carefully locate and remove the infection from your computer. Our “How to remove” team has prepared a detailed removal guide with step-by-step instructions on how to detect and eliminate “I hacked your device” in a fast and reliable manner. 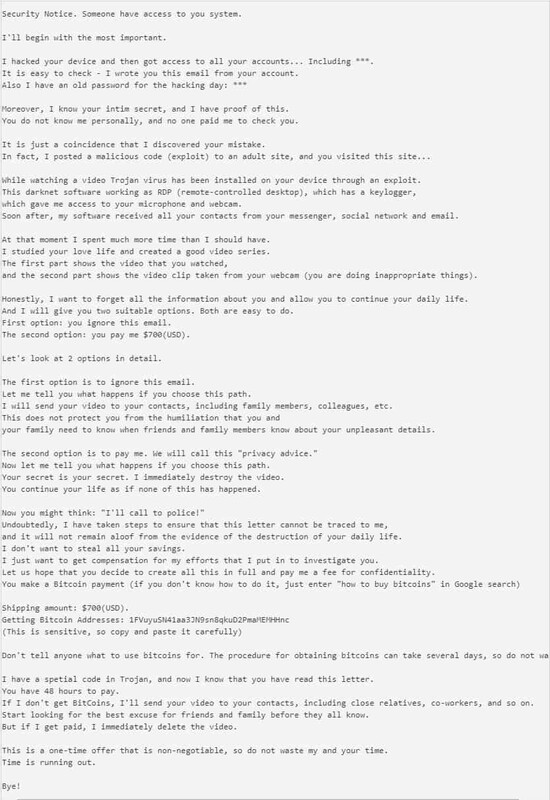 This specific infection seems to have focused on spamming the users’ mailboxes with a demanding message that asks them to send a certain amount of money to a specific BitCoin wallet. How seriously can “I hacked your device” damage your computer? Since most Trojan-based infections tend to be extremely versatile in their purposes and capabilities, we cannot tell you what exactly to expect from a sophisticated malware infection like “I hacked your device”. The criminal creators of the virus may decide to use its harmful code for a number of illegal activities such as data corruption, theft of sensitive information, espionage, system destruction, and even distribution of viruses such as Ransomware, Spyware, or other malicious programs. There is definitely no need to wait and see what will happen to your PC because the damage may be irreparable in some of the cases. That’s why we strongly advise you to take immediate action and remove “I hacked your device” from your system with the help of the set of instructions in the removal guide below. If you are a frequent computer user, you surely can name at least a few of the most common potential sources of computer threats. The Trojans, in particular, can be encountered in almost anything that is available on the Internet – from pirated programs, torrents, spam email attachments, ads, and shady webpages to legitimate-looking messages, offers, software installers and tools that the users may download for free from the web. Even reliable-looking websites may be compromised and infected with Trojan-based code and that’s why it is really important to always be mindful while browsing the Internet. Try to carefully pick the content that you interact with and stay away from anything that may appear fishy or suspicious. Unless a certain malware piece can infect you without the need for any action on your end (such viruses are pretty rare), the safety of your PC is largely in your own hands and you should try to protect it not only by avoiding potential malware transmitters but also by installing reliable antivirus software on the machine. The reason is, no matter how careful you could be, there is always a chance that you may get tricked and thus interact something harmful. Moreover, in many instances, the Trojan Horse infections don’t have visible symptoms and this is where the role of the antivirus program comes – it is designed to spot and locate the harmful content and notify you about it so that you can take immediate action to remove it. Symptoms This Trojan rarely shows any visible symptoms, that’s why it is best detected with a security software. Distribution Method Spam messages, infected email attachments, Malvertising, harmful downloads, infected files and links, malicious software installers.